Today, I’m happy to announce that a Disney Park staple has been returned to it’s former glory and is now open to guests: Walt Disney’s Enchanted Tiki Room has now reopened at the Magic Kingdom. After a fire in January of this year, Disney has been refurbishing the attraction to restore it to it’s original show. Many amusement park enthusiasts may not be familiar with the Enchanted Tiki Room and assume its just some other theme park show. However, the Enchanted Tiki Room historical significance expands to all theme parks, as it revolutionized technology of dark rides, shows, and most every other themed attraction. So “Come to the Tiki Room! Hurry to the Tiki Room!” as its time for a short history lesson on Walt Disney’s Enchanted Tiki Room. When it opened at Disneyland in 1963 (Behind the scenes video from YouTube user freedogshampoo), it was the world’s first introduction to Audio-Animatronics. What is an Audio-Animatronic? The invention (and coined phrase) were developed by WED Enterprises (today known as Walt Disney Imagineering) and in a nutshell, Audio-Animatronics are robotic figures synced to music. This allows the robots to achieve the effects of singing, dancing, and producing life-like sound effects. Audio-Animatronics would later go on to be used in nearly all major Disney attractions including The Haunted Mansion, Pirates of the Caribbean, it’s a small world, and many, many more. The show itself stars four charismatic birds, each with their own distinct colored feathers and accent. Jose, Pierre, Michael and Fitz host a magical musical journey including sweet-singing birds, serenading flowers, chanting tiki totems, and drumming tiki gods. The show concludes with a thunderous storm spontaneously appearing outside the hut’s walls due to all the celebrating. Music for the show was composed by the Sherman Brothers whose other projects with Walt Disney include Mary Poppins, it’s a small world, and The Jungle Book. When Walt Disney World opened in 1971, a version of Disneyland’s Enchanted Tiki Room opened under the name “Tropical Serenade“. While the show remained almost un-touched from the original, the new Floridian version included a new wrap-around queue that surrounded a preshow. Instead of an assortment of Tiki Gods around a courtyard, the new preshow focused on two birds who hinted at the Floridian location with mentions of Florida’s famous orange groves. On January 12, the ill-guided “New Management” caught fire, and no guests were harmed, it did cause signifiicant damage to the attraction. The Enchanted Tiki Room would shut it’s doors for repairs for an unknown period of time. 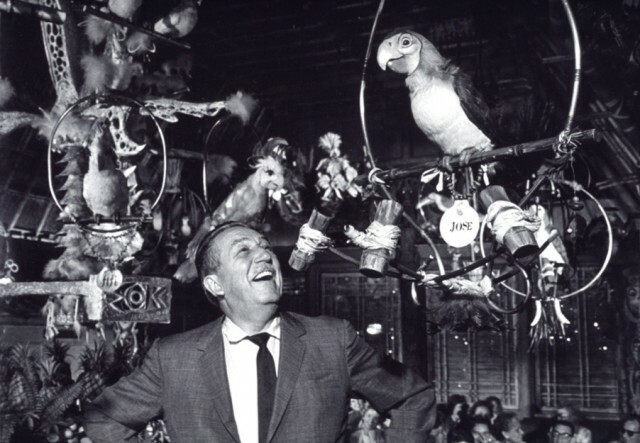 4 months later, Disney announced it would be re-opening the attraction once again to become the Enchanted Tiki Room, inspired by both the Califorinia version and the original Tropical Serenade show. Today marks the official re-opening of the Tiki Room at Walt Disney World. The video above, captured yesterday during a preview by Inside the Magic, shows this latest incarnation of the attraction is a beautifully updated version of the original Tropical Serenade. Removed is some of the unnecessary commentary from the California version, the enchanted fountain is replaced by a floral center piece, the windows now reveal the hut’s spectacular beach setting, as well as a number of fantastic lighting effects update the attraction while staying true to the original. Enchanted Tiki Room is a refreshing break from the super-massive, movie based dark rides of today and goes back to the company’s roots in putting on an entertaining, original show that the whole family can enjoy. If you’re in the parks be sure to stop by, and check out this refreshed, but still classic, attraction. to read and know more about such kind of stuff.